You know you do it. We all do. #yoga. #yogaeverywhere. #yogaeverydamnday. #yogaoffthemat. #facedownasanaup. #getcrazywithourhashtags. If you were born before, let’s say…1990 or so, you still remember life without social media. I come from a generation of kids probably much like yourself (who might be reading this blog based on a social media post)- we are super connected. We are on our smartphones, and more than that, we are becoming dependent on them…think about how often you plug in an address to your GPS in a city you’ve lived in your whole life! There is research emerging about how social media is actually detrimental to our self-esteem, and I would begin to argue that it is actually fostering a sense of competition that isn’t necessarily healthy. We are constantly announcing everything from mundane tasks to pregnancies to mourning deaths. I even saw one person throw up a customer service number to a business she was unhappy with and advocated that if you were pissed off or having a bad day, to call and yell at the customer service manager. Ouch. I often wonder what a healthy relationship with social media looks like- especially when so many of us fail to find balanced lives in our general day to day actions. 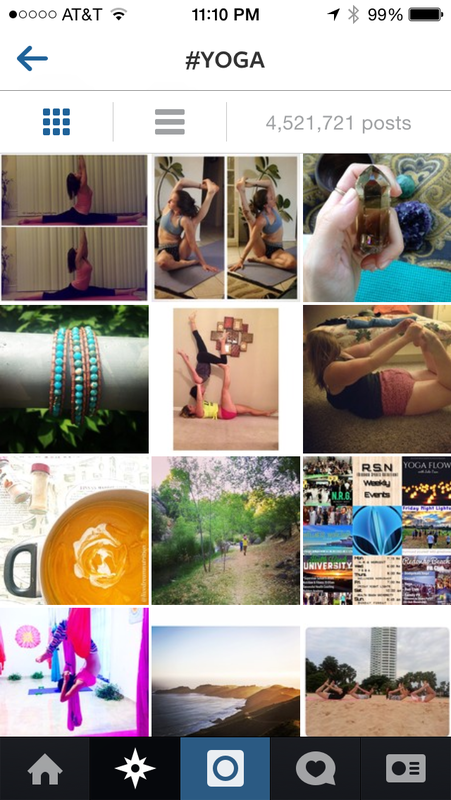 Social media has not only deeply penetrated our lives in general, but also the online yoga community. I would “pose” (pardon the pun) this question to you: in a culture that already places so much importance on the asana, what are our intentions in posting them all over social media sites? Don’t get me wrong. I don’t want to criticize those that do share beautiful asana posts, but I want to instead shed some light on what you might be provoking and pervading- aside from the obvious (ego). It’s so easy to covet beautiful people and beautiful practices like those of @LauraSykora, @yoga_girl, @beachyogagirl, @dashamalove… and those are just a few that I personally followed. Let me also preface that I do not personally know these people, but even those that I do know that participate in #stopdropandyoga, #summersplitchallenges, #bamhandstandchallenge, #mayIbegin, #backbendbonanza….whatever it may be… my immediate judgment of the intention of your photo is that you want people to see what you can do. One of the beautiful things about the online community is that we celebrate each other. Congratulations for getting 20 likes for doing an inversion on top of a mountain. However, I want to challenge you (and bring to light) that what you are also saying (by not saying it), is “Look what I can do….that you can’t.” So not only does it seem that we are building onto our already pervasive ego by getting comments like “you look so beautiful!” or “that is so awesome!” people are also saying “I would never be able to do that.” I already think that our asana practice is expensive and therefore exclusive…so why are we as yogis promoting exclusivity with daily postings of asanas- most of them way past beginner poses? Furthermore, how is that bringing more mindfulness into the community of yoga practitioners, the communities we live in, our countries, and our world? From personal experience, I had to check myself. I had to quit following the strangers who looked beautiful in their asanas because it began to make me feel bad about my practice, my non six-pack abs (read: beer belly), and my occasional hormonally induced junk food cravings. I let myself fall into the easy trap of comparing my body, eating habits, lifestyle, and practice against theirs. The fact is, after 10 years of practice, I still can’t do a handstand. Or wheel. Or most inversions and arm balances. 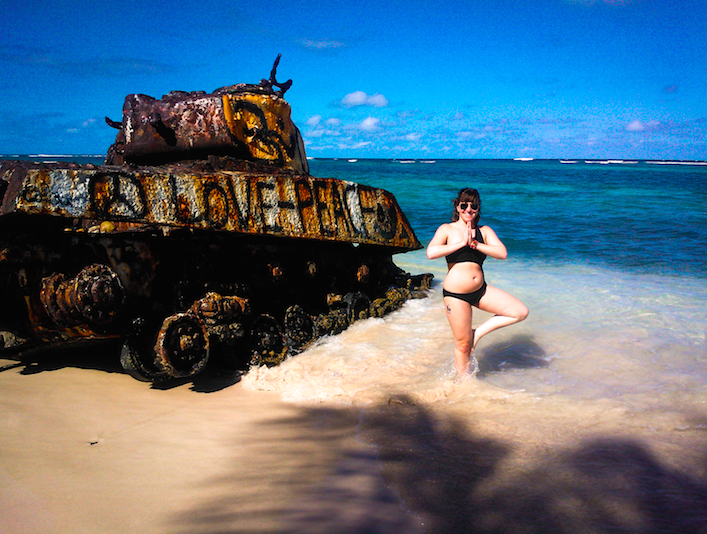 I found myself having to convince myself that those things don’t make me any less or more of a yoga practitioner. I had to take a hiatus. I quit following all those people. For me it boils down to being really rooted in who I am and the only way I can check myself is by not participating. I also have to continually check myself not to judge those that I personally know who participate in the aforementioned challenges, because I do appreciate that there is an element of fun to it. But, I also think it arguably borders on narcissism. Even if they posted pictures/videos of practicing kindness…I would still question why. And I think we should. It’s about finding a balance of sharing the practice without making it about you. So while on occasion, I will use hashtags, and post pictures of my lunchtime meditation attempts (mostly of foliage- #notselfies), I think it is time think broader about the effect it might be having on the average individual. Are they trying these poses at home? Are they safe to practice for the average individual without the guidance of an experienced teacher? Furthermore…what is the reason for your asana posts? Ask yourself, and be honest about it, are you doing for some form of social acceptance? Is it inclusive or exclusive of the average individual? I would challenge our yogis and yoginis out there to get mindful about our presence on social media and how we are representing ourselves to the overall community. Before you answer “How are you feeling?” and then press “post,” take a breath. Treat it just like any other practice. Find an intention, and then hold to that. Maybe even share more of your heart, and less of your body. 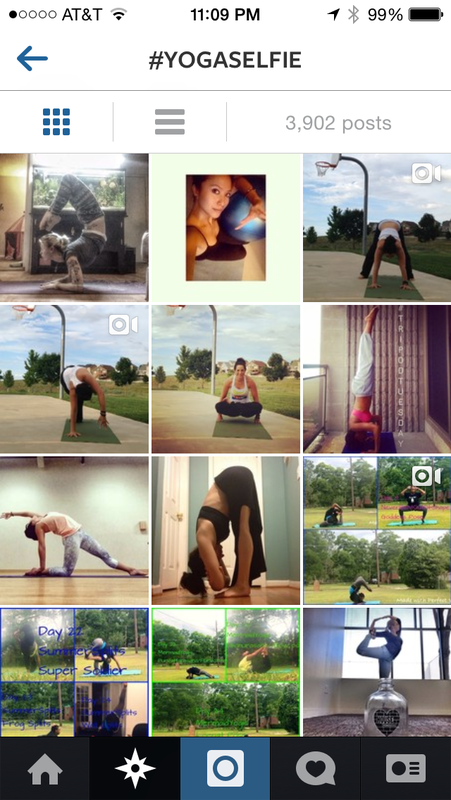 Pictured here (but not yet posted on social media…until now), Megan Escalona is “almost” native to Atlanta and has been practicing yoga for almost 10 years. She’s not your typical “flexible” yogini and promises to ensure that some form of each pose can be accessible and comfortable to each student. The foundation of her personal practice is pranayama (breath work) which she integrates into her classes. 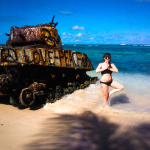 Megan hopes to help her students reach their physical goals through their asana practice, but also believes the spiritual practices and philosophy can deepen your quality of life and therefore aims to bring in these elements to her classes as well. She is a lifelong learner, speaks fluent Spanish and lives with her husband Eduardo and Lola, her German Shepard mutt. She loves cooking, eating, craft beer, music, and sunshine. You can check out her Facebook page at for Vida Yoga or go see her on Thursday and Friday evenings at Vita-Prana Yoga in Smyrna.